During the medieval period in India, worshipers of Surya formed one of the five principal sects. Worship of Surya ranked with the worship of [[Shiva]], Shakti, [[Vishnu]] and [[Ganesha]]. The importance of the Sun God Surya is evident in Vedic hymns and Hindu mythology. The Gayatri hymn from the Rig-Veda identifies Surya with the Hindu Trinity. The hymn is addressed to the sun and associates Brahma with the sun in the morning, Shiva with the sun at midday, and Vishnu with the sun in the evening. The worship of Surya is mentioned repeatedly in the Ramayana, the oldest epic in Sanskrit literature. After offering a prayer to Surya, Rama overcomes his enemy with ease. During the medieval period in India, worshipers of Surya formed one of the five principal sects. Worship of Surya ranked with the worship of [[Shiva]], [[Shakti]], [[Vishnu]] and [[Ganesha]]. The importance of the Sun God Surya is evident in Vedic hymns and Hindu mythology. The Gayatri hymn from the Rig-Veda identifies Surya with the Hindu Trinity. The hymn is addressed to the sun and associates [[Brahma]] with the sun in the morning, Shiva with the sun at midday, and Vishnu with the sun in the evening. 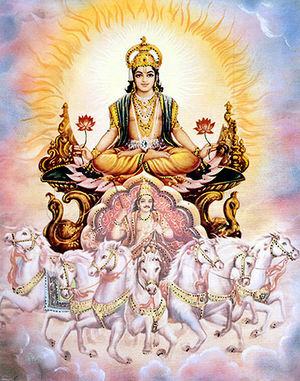 The worship of Surya is mentioned repeatedly in the Ramayana, the oldest epic in Sanskrit literature. After offering a prayer to Surya, Rama overcomes his enemy with ease. One Hindu myth relates that the sun-god Surya married the daughter of the celestial architect of the gods. She found Surya’s radiance too strong to bear and ran away. Surya pursued his wife and after a long search found her. 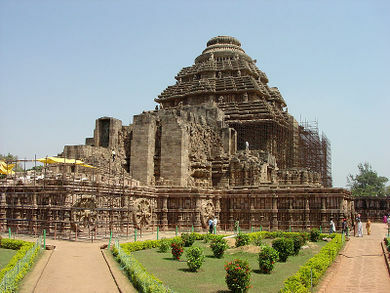 Once they were reunited, the architect of the gods refashioned Surya so that his wife would be able to remain with him. While singing praises to the sun god, the architect cut away his excessive radiance, keeping intact just a fraction of his original glory in spherical shape. Out of the excess radiance, he created weapons for various gods, including Shiva’s trident. Surya remained resplendent in spite of his alteration. He and his wife had many sons. The eldest was [[Vaivasvata Manu]], who in Hindu tradition is the progenitor of the human race. We know Vaivasvata Manu as the manu of the fifth root race. One Hindu myth relates that the sun-god Surya married the daughter of the celestial architect of the gods. She found Surya’s radiance too strong to bear and ran away. Surya pursued his wife and after a long search found her. Once they were reunited, the architect of the gods refashioned Surya so that his wife would be able to remain with him. While singing praises to the sun god, the architect cut away his excessive radiance, keeping intact just a fraction of his original glory in spherical shape. Out of the excess radiance, he created weapons for various gods, including Shiva’s trident. Surya remained resplendent in spite of his alteration. He and his wife had many sons. The eldest was [[Vaivasvata Manu]], who in Hindu tradition is the progenitor of the human race. We know Vaivasvata Manu as the [[manu]] of the fifth root race.